It is strange to see Kimi in the PC again this week. And still no cap, yeah!! Second - Kimi left Australia last Sunday evening, flying to Malaysia. No time for celebration he said, but hopefully team will celebrate for real at the end of season. If this is not a determination, than what is it? Is it me or he behaves a bit differently comparing to the last year? Yep that sounds pretty determined! first: D thanks! " title="ii" /> " title="hug" /> i want to see if those rookies are any better than Vitaly or Heikki for example! 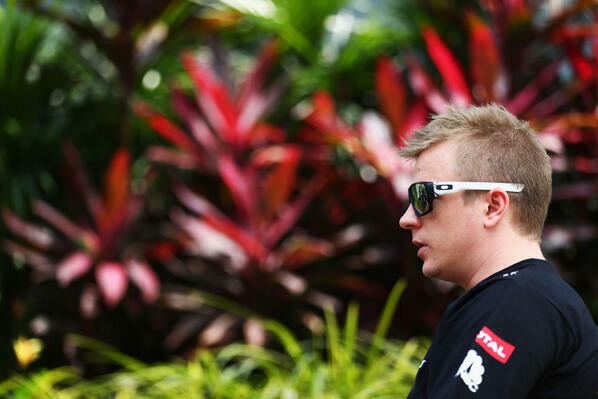 Kimi Raikkonen says there is no extra pressure on Lotus despite winning the season-opening race in Australia. It took Lotus until the 18th race of 2012 to record its first win when Raikkonen won in Abu Dhabi, but this year it has immediately delivered on its potential to lead the championship at the first opportunity. Despite marking itself out as a contender for race victories from the start of the season, Raikkonen says there will be no change of approach within the team. "There's no target or anything, we don't do any different things this weekend that we did in any previous race or last year," Raikkonen said. "If people think we are the kind of leaders it makes no difference to our work, what we did or what we're going to do this weekend or any other weekend. We just try to do our best and hopefully can score some good points." With Malaysia set to bring much higher temperatures than Melbourne and pre-season, Raikkonen is hoping Lotus has retained the trait of being strongest in hot conditions. "Last year we were pretty good when it was hot and actually it was better for us but obviously we haven't run in this kind of condition and the winter has been very cold so I have no idea. If it's anything like it was last year it should be pretty OK but we have to wait and see how it goes." Having been well off the pace of Red Bull in qualifying last weekend before winning the race, Raikkonen said the turnaround wasn't as pronounced as it seemed and that the gap in qualifying was just down to the conditions. "The qualifying wasn't a very normal situation with all the weather and we got delayed and all that stuff, so if it's normal dry conditions I'm pretty sure we are more close - I hope at least. So we'll wait and see, once we get the normal qualifying done I'm sure we are not a second behind." It seems like the worst is predicted for Friday. I hope it doesn't mess with time to setup the car. Yep, Oskari Saari tweated it has rained every day durig 14-16.00. The race starts at 16.00. So..quali could be wet , again. About Kimi..well, you know I look at the pictures and hear the interviews and make my assumptions base on those..or have "a feeling" about things. Kimi will win championship and wins it by a large margin. Kimi will win the championship but Alonso will give him tough times. no surprise Kimi had to go to pc again, it's usually last race winner there.